UD Rome offers students the perfect setting for serious learning, true fellowship and meaningful personal reflection and spiritual growth. With the support of faculty and staff, students enjoy the benefits of an intense academic program as well as the pleasure of getting to know each other in the secure and supportive surrounding. The student life staff strives to promote the health, safety, good conduct and academic achievement of all students participating in the Rome program. Health services, discipline, student life events, athletics, administrative, academic and program trip assistance are all supported by the Student Affairs Office and its staff, under the direction of the Senior Director. Further information can be found in the Rome Student Handbook. 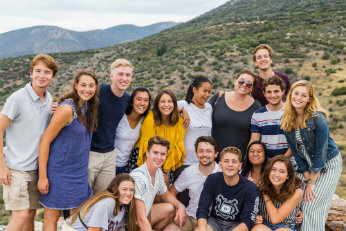 The Rome Semester hosts numerous on-campus social occasions that are linked with important dates on the semester's calendar, including the program opening and closing ceremonies, and events leading up to our major academic trips to Greece and Northern Italy. 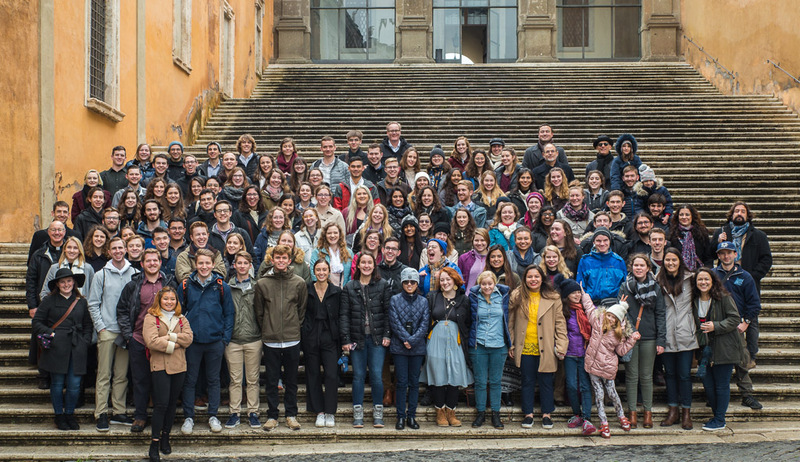 During their first week on campus students participate in a Rome or Castelli Romani tour intended to acquaint them with local culture and cuisine. The "G(r)eek Olympics" is an afternoon-long athletic and theatrical fest launching the Greece trip. Students, professors and staff join together to harvest grapes in the vineyard every fall. And many other such events take place throughout the semester, including a talent show, live music events, Forno BBQ dinners, and the traditional intramural soccer tournament. numerous medical specialists in both the campus area and the center of Rome, all within reach by public transportation or taxi. In the rare event of a health emergency, UD Rome calls on its long-standing relationship with several local hospitals, notably the Salvator Mundi Hospital and the Rome American Hospital. Both institutions have English-speaking and US trained medical professionals on staff. There are a limited number of positions available for students who wish to make a little extra money while in Rome. These are assigned and supervised by the student-life staff, but are governed by work study awards at the University of Dallas in Irving. During the first week of each semester there is an organizational meeting in order to make a final determination about eligibility, interview students for particular assignments and fix working hours. One of the greatest aspirations of UD Rome is to help students learn about and ultimately assimilate into daily routines of Italian life. With this in mind, the student life staff sponsors regular off-campus events during the course of the semester, including walking tours, site and museum visits. In addition, they maintain a Information Pad (IPAD) in the student lounge, where special notices about gallery openings, museums, art exhibits, free concerts and optional tours can be found. Approximately 150 guests visit the Rome Campus every year. These include trustees, alumni, Irving faculty and staff members, clergy, friends and family of current students, and prospective students. Guest accommodations are available on a limited basis for visiting alumni, faculty, staff and parents. Please call or email us ahead of time to make an appointment if you plan on visiting. Ben attended the UD Rome semester in Fall of 2012 and graduated from the University of Dallas with a BA in History, concentration in International Studies and Masters in Business Administration from the Satish and Yasmin Gupta College of Business. Ben worked in UD's Office of Advancement for several years as an Advancement Officer and Associate Director of Corporate Relations & Partnerships before moving to the Eugene Constantin Rome Campus. Stephen Henderson graduated with a B.A. in English from the University of Dallas in 2017. Born and raised in Pensacola, Florida, Stephen traveled to Europe for the first time for the fall 2014 Rome semester. 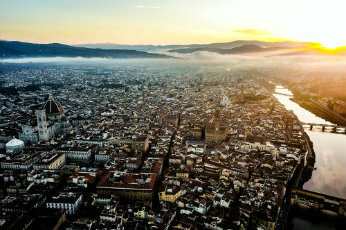 He is excited to be back in Europe at the "Due Santi" campus to work as a Rome Resident Coordinator for his alma mater.